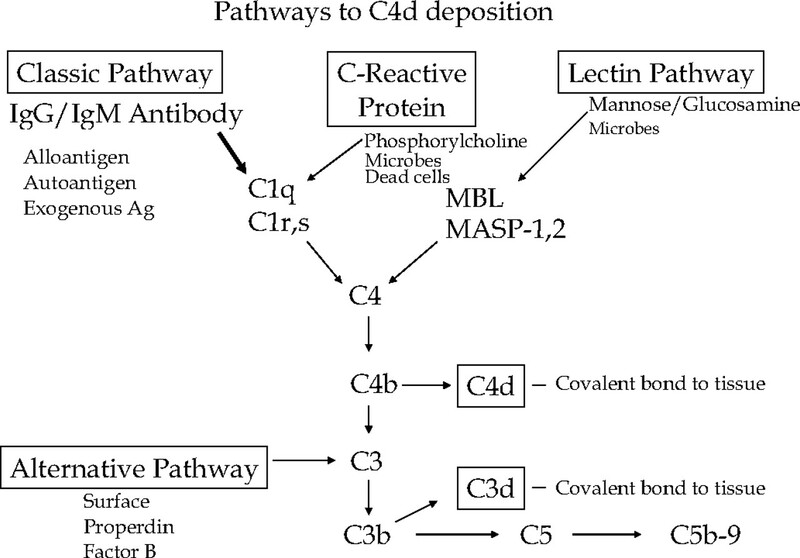 Complement activation pathways. The classic pathway is relevant to antibody-mediated rejection. The other pathways have not been shown to participate in acute or chronic rejection. C4d remains covalently bound in the tissue for several days after complement activation (see text). Adapted from reference (6), with permission. Acute humoral rejection. A 43-yr-old man developed rising creatinine (1.2 to 2.1 mg/dl) 6 mo after transplantation while he was on Prograf, CellCept, and prednisone. The patient had a high titer of IgG anti-donor class II antibodies. (A) Light microscopy shows interstitial edema, tubular injury, and neutrophils and mononuclear cells in peritubular capillaries (PTC). (B) Immunofluorescence (IF) microscopy demonstrates widespread, bright, linear staining of PTC for C4d. Chronic humoral rejection (CHR). An 18-yr-old woman 13 mo after transplantation had a rise in creatinine (1.2 to 1.6 mg/dl) and is on Prograf, CellCept, and prednisone; anti-donor HLA class II antibodies in serum. 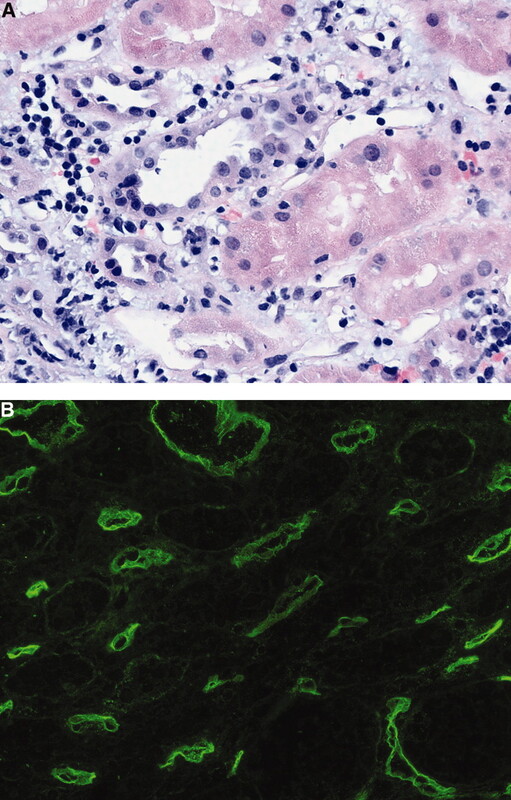 (A) Transplant glomerulopathy with duplication of the glomerular basement membrane (GBM) and accumulation of mononuclear cells in glomeruli (periodic acid-Schiff stain). (B) Immunofluorescence shows a patch distribution of C4d positivity in PTC. (C) Electron microscopy shows duplication of the GBM and reactive endothelial cells. (D) The PTC have prominent multilamination of the GBM. 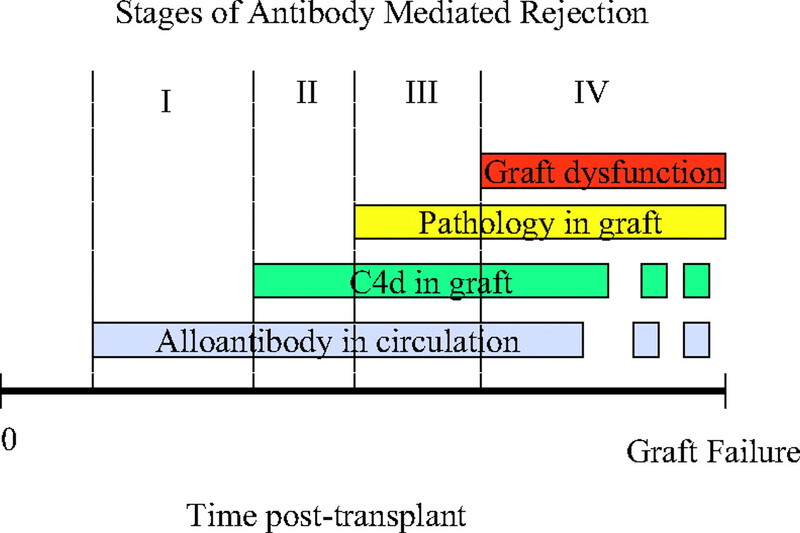 Postulated stages of antibody-mediated rejection. Stages I to II represent accommodation, stage III represents subclinical humoral rejection, and stage IV represents CHR. The dashed lines for antibody and C4d deposition are meant to reflect the possibility of intermittent positivity over time. Inevitability of progression is not meant to be implied by the term “stages.” The rate of progression is likely to be variable, and the early stages, I and II, are reversible. At any stage, the antibody/C4d may become negative, in which case the process is inactive. Accommodation. 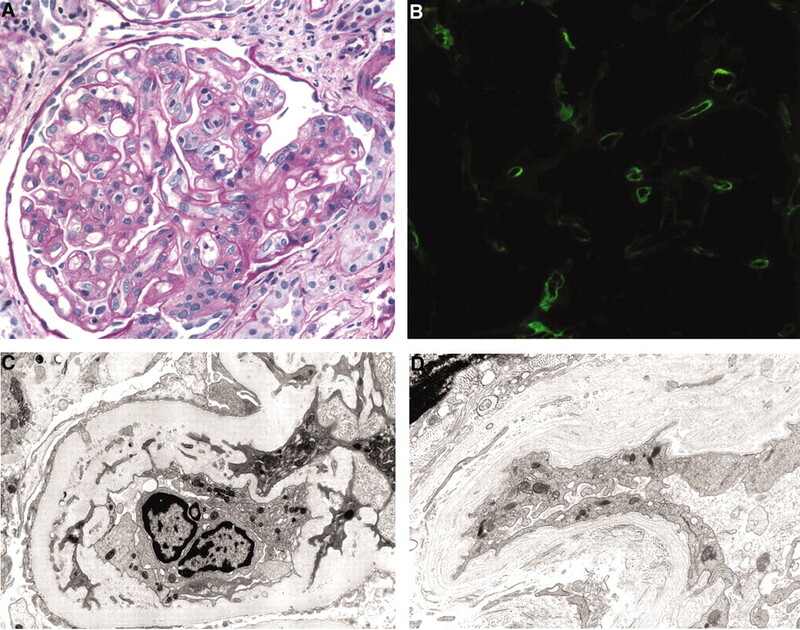 Protocol biopsy 1 yr after renal transplantation in a recipient with normal renal function (creatinine 1.5 mg/dl) and antibodies to donor class II antigens. (A) Light microscopy is normal. (B) Prominent C4d deposition in PTC is present. (C) Electron microscopy shows no glomerular abnormality. ↵a EM, electron microscopy; GBM, glomerular basement membrane; PTC, peritubular capillary. ↵a Cases that meet only two of the three numbered criteria are considered suspicious for AHR. Acute cellular rejection may also be present. ↵a If only two of the numbered criteria are present, then the diagnosis is considered “suspicious” for CHR. ↵b May be patchy in distribution.